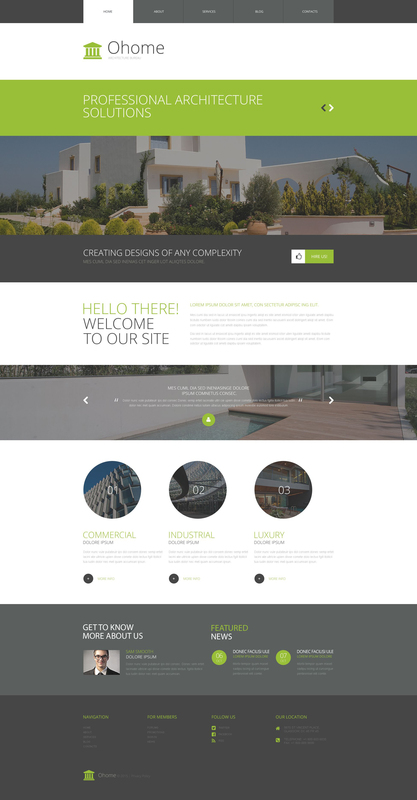 If you need to create an online presentation for reputed architectural company, take this template. It will become a great basis for your easy start. Two sliders that feature company projects and customers' reviews make the users' viewing more interesting. Template's layout is mostly grey, which imparts it a solid look, however green elements revive the general feel and help the users understand which information should be read at first turn. Round banners, icons and buttons also contribute to the stylish template's appearance. Online chat by means of tech support can be a signal for the site visitor - â€œthe following provider definitely worries about meâ€. The end users don't have to wait a lot of time for their ticket to become fixed or go through loads of documents to uncover the solution for himself. Warm and friendly tech support expert could answer him almost immediately and definitely will resolve his trouble in a virtually no time. Are images included in the Designer WP themes released under GPLv3.0 license? If you purchase the product at a â€˜Buyout price' it guarantees that you are the last person to buy this template from us. It means that this Design & Photography WP template may have been sold before a couple of times (see â€˜Downloads' number in item's properties) but only you and people who bought the template before you will own it. After this kind of purchase the template is being permanently removed from our sales directory and is never available to other customers again. The buyout purchase license allows you to develop the unlimited number of projects based on this template, but the template should be customized differently for every project. If you purchase the product at a â€˜Unique price' it guarantees that you are the first and the last person to buy this Photography WordPress theme from us. It means that this template has not been sold before and you become an owner of a unique design. After this kind of purchase the template is being permanently removed from our sales directory and is never available to other customers again. The unique purchase license allows you to develop the unlimited number of projects based on this template, but the template should be customized differently for every project.